Leo Pellow, St Ives, Cornwall, United Kingdom (Born: 9th September 2002) (T21) Leo started learning to swim when he was four and has always had a great love of being in the water. Leo started in the sport of Surf Life Saving where he took part in his fist pool and sea competitions at the age of 7. He later joined St Ives Bay Swimming Club and started competing in local galas. At the age of 8 he won an Endeavour cup, competing as the only disability swimmer in the local town harbour race. At the age of 12 Leo had his first experience of Down Syndrome swimming competitions when he took part in the European Open competition held in Southampton, England each year. 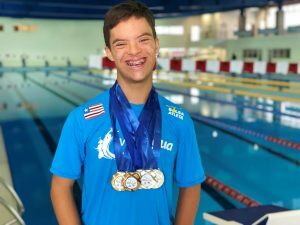 He came away with a heat gold medal and a number of ribbons and a great awareness of what Down Syndrome swimmers could achieve. In the same year he moved to the Junior age group at Surf Life Saving, taking part in the Nationals where he competed in events such as carrying a full weight manakin (54kg) the length of the 50m pool, as the only disability swimmer. Leo also competes as an S14 swimmer and has open qualifying times at Regional level and has also competed in the National Junior Para competition and Learning Disability Nationals, representing St Ives Bay Swim Club. He also enjoys taking part in local sea swim competitions and biathlons. Now in his final year at school, Leo holds 6 DSISO Junior World Records in 200m breaststroke and 400m freestyle long course, 800m and 1500m freestyle long and short course and European records in 100m backstroke and 200m freestyle. During the summer season, Leo swaps the pool for the beach where he loves to kayak and surf as well as training with the St Ives Surf Life Saving Club. He can often be found paddling his kayak across the beach with loads of local children either balanced on his kayak or being towed along behind. Minke Janse van Rensburg, Swimming, (4th October 2004) – Oudtshoorn, Western Cape, South Africa. Minke Janse van Rensburg is a George (South-Africa) resident with Down Syndrome (T21) who is not discouraged by her disability in anyway whatsoever. In her mind, she is as good a sport person as anybody else and her outstanding achievements results from hours of dedication, motivation and practice, and of course the support and encouragement from her coach, family and friends. Only 6 months after her very first school gala, at the age of 13, she made the National Team and competed at the 9th DSISO world championship in Canada where she set a new 50m freestyle junior world record and received bronze in the open category of this event, beaten only by swimmers twice her age. 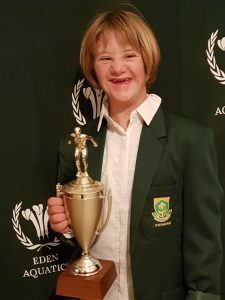 Within a year after her first National championship Minke holds 3 junior world records, 11 junior Africa down syndrome records and 2 open Africa down syndrome records. She is also part of relay teams that hold 4 open relay Africa down syndrome records.